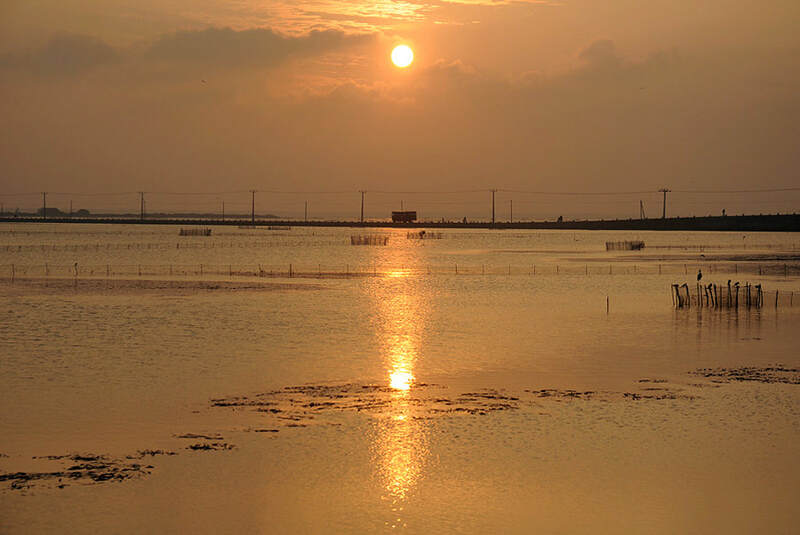 After the end of the civil war, more and more guests are attracted to Jaffna Peninsula, the heartland of Sri Lanka's Tamil culture. It's a part of Sri Lanka bearing more similarities to India than any other region of the island nation, though Jaffna is distinct and unique also when compared to southern India. For travellers, Jaffna city is the perfect starting point for various excursions exploring the peninsula and the neighbouring islands. Kayts, the largest of them, can be reached easily from Jaffna via a causeway. Jaffna's main attraction is the colonial Dutch Fort. It's Asia's best preserved fortification of a typical Dutch layout. The suburb Nallur, which was the capital of the Jaffna Kingdom in the period from the 13th to 17th century, is home to the largest Hindu temple complex of Sri Lanka, the Nallur Kandaswamy Kovil. This main temple of Tamil Hindus in Jaffna is situated in only 2.5 km distance from Jaffna Fort or 1.5 km distance from Jaffna central station. The railway station just in between the commercial city centre and that most important place of worship, is located in a quarter where most of Jaffna's hotels and guest houses can be found. Another landmark of Jaffna is the white building of the Jaffna Library; the colonial edifice has been reconstructed after being destructed in the civil war. 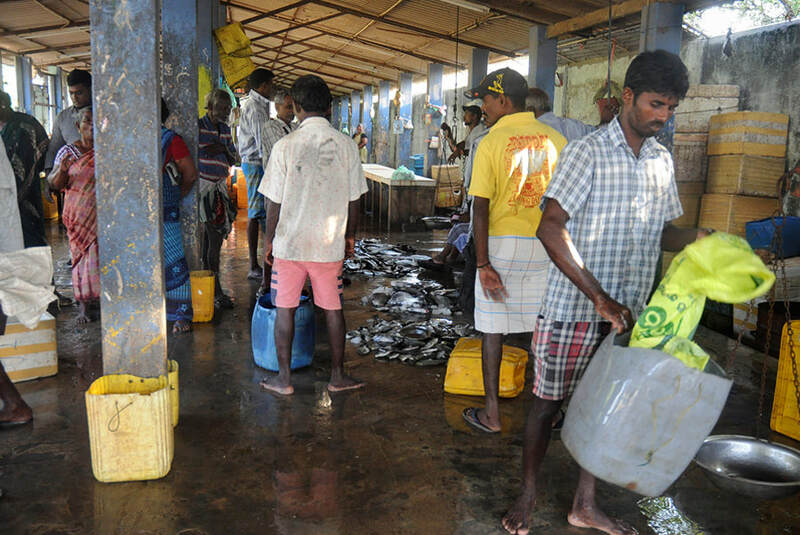 Not surprisingly, fish is the main article of trade at Jaffna market. Kasthuriyar Road, just north of the market, is crowded with jewelry shops. Let's start our Jaffna sightseeing tour not far from the railway station. There's a Buddhist monument which is a symbol of both the most ancient and the most recent period of Jaffna's history. The Nagavihara at Stanlay Road, halfway between city center and Nallur, is the only significant Buddhist temple within the town of Jaffna. Jaffna Peninsula, though now the bastion of Hindu culture in Sri Lanka, has a long Buddhist history. In ancient times, the ethnical divide, if there was any at all, played a minor role, since many Tamil traders were Buddhists and local deities quite similar to those venerated in Tamil Nadu in neighbouring mainland India were worshipped by Sinhalese, too. Jaffna may well be the place called Nagadipa in Sri Lanka's Buddhist chronicles. Today, 'Nagadipa' is the Sinhala name of the small island of Nainativu. However, the ancient cronicles, written by Buddhist monks in Pali language, mention that Nagadipa was of huge size. It's highly likely that 'Nagadipa' was once the name of the entire Jaffna Peninsula, which actually is an island. The area called Nagadipa in Buddhist historiography is of utmost importance for Sri Lanka's religious history, because it is one of the places visited by the Buddha according the account of the chronicles. He is believed to have settled a dispute between two Naga princes. The word 'Naga', meaning 'serpent' or 'cobra', may refer to a local tribe once worshipping this animal. Naga cults are known from various cultures all over the subcontinent. However, Tamil historiography has it that the people meant by the term 'Nagas' in the chronicles were Tamils or, more specific, those of them living at coastal areas of southern India and Sri Lanka in ancient times. Thus the term 'Nagavihara', which translates to 'Naga Buddhist-monastery', could be well interpreted as referring to a joint history of Tamils and Sinhalese. However, Tamil and Sinhalese ideologists adapting and upholding the colonial ambition to separate and divide ethnicities - thereby ironically maintaining those concepts of nationhood which are of Western origin - were eager to foster a more hostile interpretation of Buddhist presence in the Hindu heartland of the island. In the decades of ethnic conflict both of the adversary factions tended to see the Nagavihara as a symbol of a Sinhalese-Buddhist priority claim, with opposing views, of course: Ideas of Sinhalese superiority, allegedly rooted deep in history, meant nationalistic pride for the one side and provocation for the other. 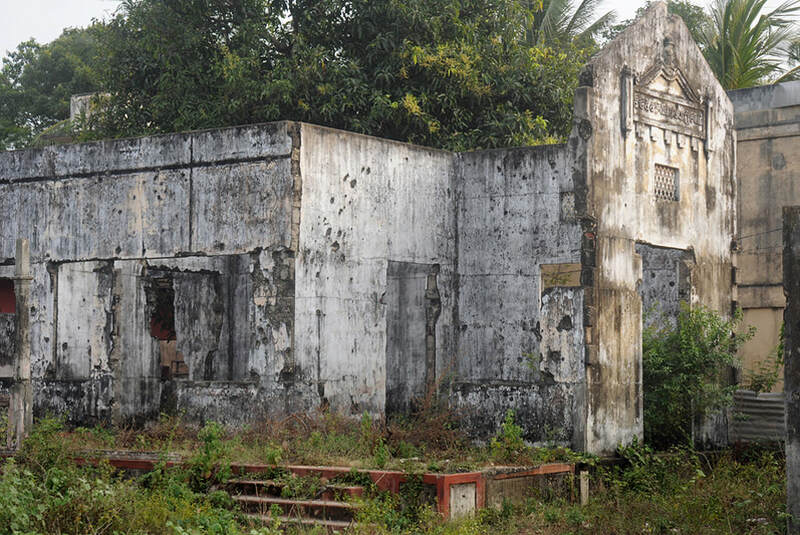 Accordingly, when Jaffna was under control of the separatist Tamil guerilla (and child soldier) army LTTE, the Buddhist sanctuary of the Nagavihara was desecrated and completed destroyed and the former temple ground served as a bus stand. After the Sri Lankan government managed to regain control in Jaffna as early as 1995, the Buddhist temple was quickly rebuilt. Sadly enough, the Sinhalese Buddhist minority in Jaffna had been completely driven out or even massacred before 1995. But the renewed presence of their main temple contributes to the completion of cultural diversity, which in a sense is more distinctive of Jaffna than ethnical homogenity. Walking through the streets of Jaffna, you will see by far more Christian churches than Hindu temples and the entire northwestern quarter of the city is dominated by mosques. Thus, a reminder of Jaffna's Buddhist history should not be missing. The annual Katina Pooja festival now organized by the Jaffna Sri Naga Vihara International Buddhist Centre is usually visited by clergy of the three other major religions, too. 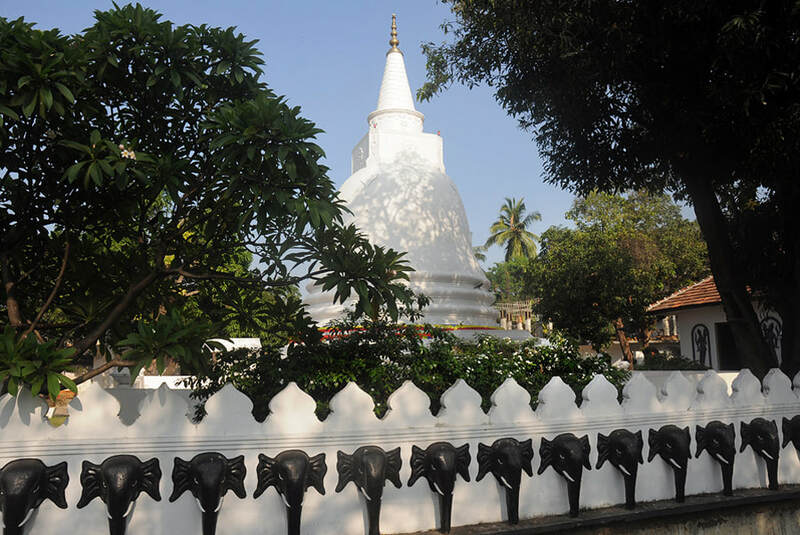 The Buddhist sanctuary is likely to be one of the oldest in Sri Lanka, since it is believed that an offspring of the Bo-tree was planted here soon after the tree's arrival from India. The landing place of Sri Lanka's holy tree, then a sapling of the original Bo-tree in Bodhgaya, was the Jaffna peninsula. Legend has it, that a sapling of that sapling was given on the request of local Naga tribesmen. There is another example of a Jaffna heritage site which is of a significance for understanding both ancient and modern history of Sri Lanka. One landmark building in the centre of Jaffna is the bright white Public Library. A first private collection of valuable books was initiated in 1933. Tamil scholars contributed further books and manuscripts and local citizens helped to develop a library open to the public. Finally, a large-scale building was designed by a Tamil architect from India. The historicising style is a typical colonial mix of Western architecture with Moghul Indian elements. It became a kind of unofficial record office of the Jaffna Peninsula at the same time. Almost all significant documents of Sri Lankan Tamil history were collected here for safekeeping and scientific research. 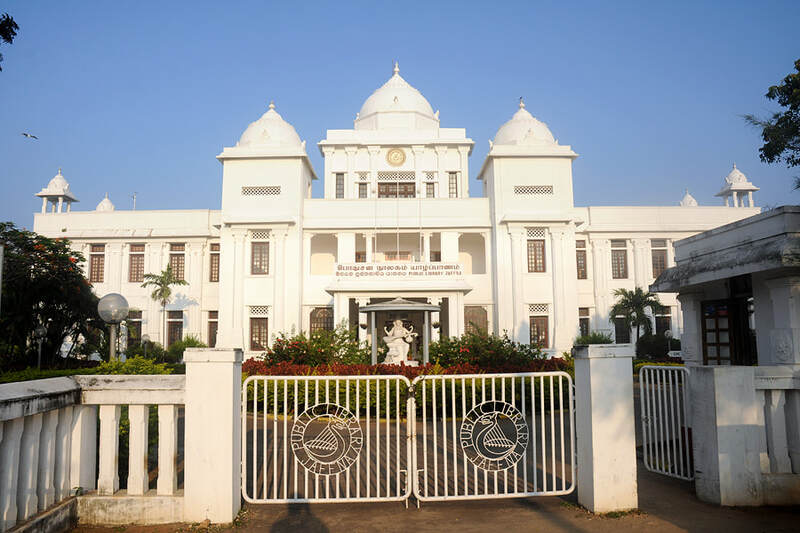 It earned a reputation as one of the best scientific libraries in South Asia and became a symbol of Tamil cultural and intellectual pride. On 31st May 1981, two Sinhalese policemen were killed at a meeting of the then separatist Tamil party TULF. Paramilitary groups of non-locals had already been brought to town by a wing of the UNP (the then ruling party in Sri Lanka) for the obvious reason of rigging district development council elections (as later President Premadasa (UNP) admitted in a speech to parliament in 1991. He did so in order to blame opponents within his own party). The 'election helpers' began to vandalize in Jaffna, with the connivance or even complicity of the police. At least four locals came to death and the head office of the TULF was destroyed. During the next night the Jaffna Public Library was burned down completely and almost all ancient manuscripts and modern books got lost. Eyewitnesses claimed that some of the arsonists had been policemen. The effects on the trust of Jaffna Tamils in Sri Lankan authorities was devastating. The relevance of this instance of biblioclasm on the eve of the civil war cannot be overestimated, since an act of aggression against a peaceful cultural core institution of highly symbolic significance fostered sentiments of being purely innocent victims, among Tamil intellectuals in particular. The attack on the central institution of Tamil heritage is surmised to have motivated many until then peaceful separatists to join one of the already existing armed rebel groups. Burning of books and even entire libraries is not an exclusively Christian or Muslim or German tradition, though these three heroic communities, for sure, own the rights to claim to have been the masters of the art for centuries. That said, such man-made loss of cultural memory occured in Asia, too, not only under foreign or colonial rule of powers just mentioned. For example, during the Golden Age of the Qing Dynasty, Emperor Qianlong felt offended by literary critics of the Qing rule and ordered those books to be burned. Nonetheless, the case of Jaffna is quite unique, as this is the only incident of biblioclasm that was not the result of a war and was carried out by Buddhists. By contrast, the end of Buddhist culture in India is marked by a carnage including the burning of the Nalanda Library by Muslim invaders under their military leader Bakhtiyar Khilji in the late 12th century. Burning of books was even unknown to Japanese sects generally regarded as the most intolerant and violent ones in the Buddhist world. Japanese military forces, however, destroyed plenty of Chinese libraries and - it has to be admitted - Zen Buddhist monks played an active role in propagating the militarist and imperialist ideology and warfare of the Japanese Empire. But Japanese biblioclasms only occured in the course of World War II. Biblioclasm caused by avowed Buddhists instead of soldiers is unique to Sri Lanka, more precisely: to the tragic period of the island's ethnic conflict. Regarding its criminal dimensions, the burning of cultural heritage in Jaffna 1981 is comparable to only two other cases of biblioclasm in 20th century Asia, namely the systematic destructions of the National Library of Cambodia in Phnom Penh, executed by the infamous communist Khmer Rouge in 1976, and that of the Puli Khumri Public Library, which stored ancient Persian manuscripts of Afghanistan's Tajik minority, carried out by equally infamous Muslim fanatics calling themselves "students", which is the translation of the Arabic term "Taliban". Pol Pot and Mullah Omar... one should be fully aware: That's the category of members of the club some Sinhalese extremists succeeded to join in 1981. In another major incident in 20th century Asia, the burning of the books was not the ambition of zealotic groups but a side effect of military combat: The Hanlin Academy Library, which was the archive of the highest ranks of Chinese court officials, fell victim to fire, when the emperor's Muslim elite troup, known as the Kansu Braves, attacked the diplomatic quarter of Western colonial powers close to the royal palace (Forbidden City) in Beijing during the Boxer Rebellion in 1900. Another example of similar side effects of combat occured on the subcontinent: When the Indian army attacked the Golden Temple in Amritsar (Operation Blue Star) to suppress an insurgency of large parts of the Sikh community, the manuscript collection of the Sikh Reference Library got lost. The building was burned down afterwards. The manuscripts, however, were not burned but robbed by members of the Indian army, in order to prevent a letter from being detected, which would have compromised then Prime Minister Indira Gandhi, as it had been written by her to the leader of the rebellion. The burning of the Jaffna Public Library by Sinhalese fanatics was a torch. It helped trigger the Tamil separatist insurgency, due to the impact on mentalities of members of a minority group - just as the shared belief of Buddhists and Hindus in the Law of Karma could teach. In a sense, the biblioclasm in Jaffna was not an effect but became one of the origins of an armed conflict, though not the root cause, but a spark, when already sitting on a powder keg. The destruction of the written heritage of the Tamil community, under the eyes or with support of security forces and government party officials, and the lack of proper court procedures afterwards convinced many Tamils that rule of a central government in a nation state dominated by a Sinhalese majority could mean: extinction of their culture would be tolerated or even welcomed. The later SLFP-led government of President Kumaratunga has apologized for what had happend under the rule of a government of the opposing UNP party two decades earlier and sponsored a careful restoration of the Jaffna Library building. A new stock of books was set up with international support. The reopening of the Jaffna Public Library was delayed in 2003, due to threats of the separatist rebel army. The LTTE, based on the logic of a typical terrorist strategy of escalation, strictly opposed any symbols of reconciliation. After the end of the civil war, another incident took place in the newly reconstructed building in 2010. When busloads of Sinhalese from other parts of the country arrived, guards did not permit entry. The groups then stormed the Jaffna Public Library and started breaking some of the shelves and throwing books on the ground in an act of vandalism. Government officials disputed this had been a deliberate attack and called the incident an altercation. A former Portuguese fort was transformed into a typical star-shaped Dutch bastion in 1680. Besides Fort Fredrick in Trincomalee, it‘s the largest fortification in the northern half of the island. The five-pointed Jaffna Fort covering 22 hectares is considered to be the best preserved typical Dutch fortress in Asia. 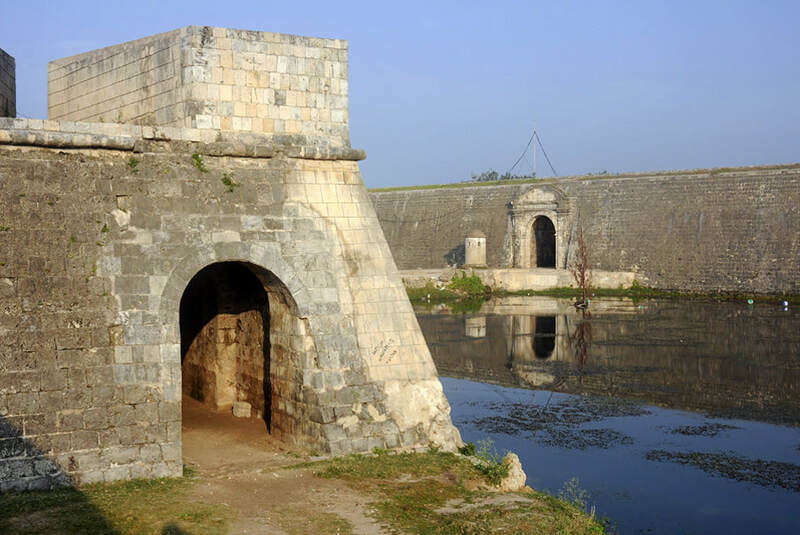 The 2 m strong limestone walls and moat are almost entirely intact. 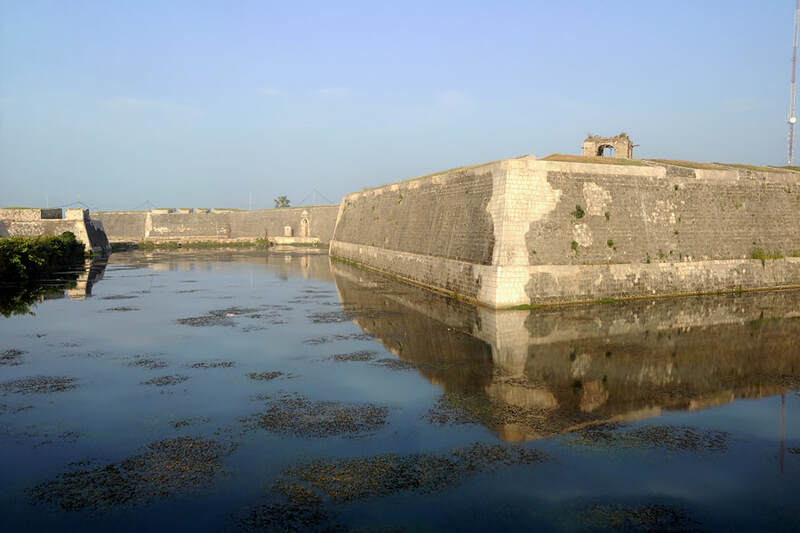 Outer bastions were added in the 18th century. After the occupation of Dutch territory by French revolutionary troops in January 1795, then establishing the Batavian Republic, the Dutch Stadholder sought refuge in Britain, where he resided at Kew Palace. He issued an order, the so-called 'Kew Letters' to all governors of Dutch colonies to deliver possession of forts under their command to the British forthwith. Jaffna Fort was taken over by the British soon afterwards, whereas Colombo fort resisted that order for a while. Although an assurance had been given to the Stadholder that Dutch rule in those strongholds would be restored after the Netherlands regaining independence from the French, this did not occur in the case of the forts in Ceylon , as the island was too important for protecting British harbours of mainland India. The harbour forts remained British till Ceylon‘s indepedence. In the Sri Lankan civil war, the Jaffna Fort was occupied by rebel troups. After the government forces managed to recapture Jaffna in 1995, the Dutch Fort served as their military base in Jaffna. It was heavily bombarded from the north. Colonial buildings such as the Dutch Church (Groote Kerk from 1705) and King‘s House (residence of the gouvernour) were almost completely destroyed by artillery attacks in the late 1990s. Reconstruction works are funded by the Netherlands. When the British gained control of the entire island of Ceylon, including the formerly independent Kingdom of Kandy, they divided the island into three administrative structures, along ethnic lines: Sinhalese highlands, Low Country Sinhalese, and Tamil areas. The capital of the latter was Jaffna. In 1833 the administrative structure of British Ceylon became more centralized and altogether five provinces were established. Jaffna from now on was the capital of the Northern Province. In the Victorian Era, clock towers gifted by the British (or given in exchange for much more valuable antiquities) were symbols of supreme technology and lasting control of the colonial rule. Determining the time was a symbol of control of everyday affairs. The Clock Tower situated not far from the Public Library, which was constructed 80 years later on, is the landmark of British colonial rule in Jaffna. 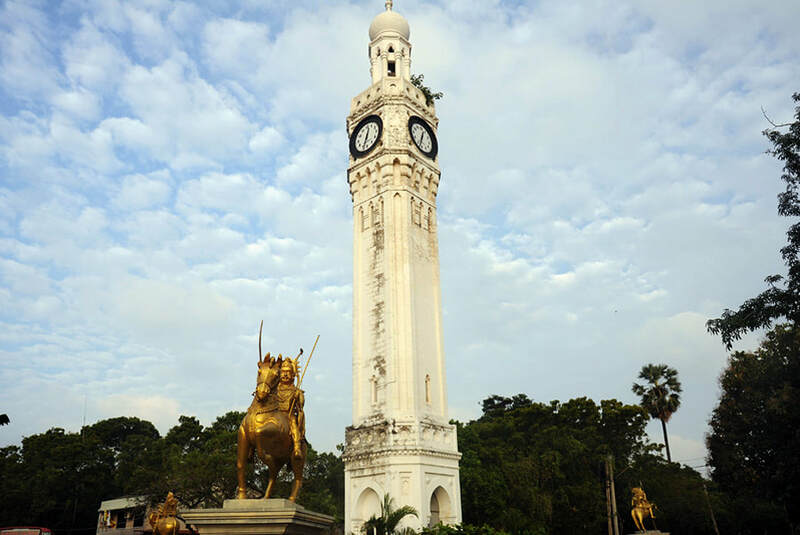 The colonial tower blended with oriental elements was erected to commemorate a visit of the Prince of Wales to British Celyon in 1875. Jaffna town is crowded with Christian churches, most of them are Roman Catholic. Almost all church buildings in Jaffna are newly constructed or renovations from the late British colonial period, replacing older and much smaller structures from the Portuguese period. Their diverse architectural designs are historicising blends of various European styles. 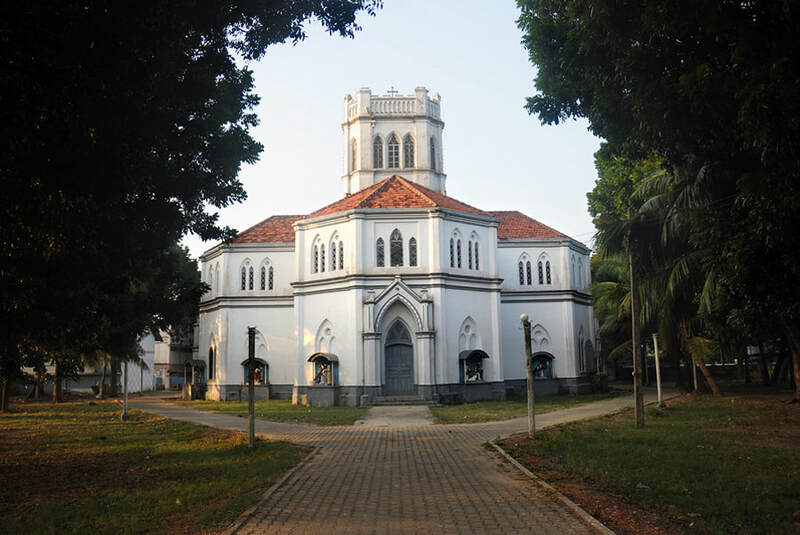 The t-shaped and 80 m long St. Mary, situated 1.5 km east of Jaffna Fort, is the cathedral of the diocese of Jaffna, promoted in 1886 on the territory of the former Apostolic Vicariate of 1845. Approximately 250.000 souls form 16% of the total population in the diocese area, compared to roughly 7% Roman Catholics in the entire island nation. Among elites of the Tamil society, the percentage of Christians is even higher. That's the reason why the ideology of the terrorist organization LTTE was not based on the Hindu religion, an often overlooked fact contradicting the assumption of a "religious conflict" in Sri Lanka. Too many high-ranking commanders were Christians. The LTTE adapted an explicitly non-Hindu ideology, which had been developed during the colonial period in southern India, suggesting that Brahmanism of northern Indian origin was alien to Tamil culture in its pure form and that the original Tamil poetical and ethical worldview had been secular in nature. Actually, many Brahmin priests were killed by the LTTE, because they showed too little interest in an armed fight against the central government. Activities of Roman Catholic missionaries began in the early 17th century, under Portuguese rule. Catholic parishes suffered persecution by the Dutch VOC, that otherwise proved to be more tolerant of other religious groups, but only those of local origin. The Dutch expelled all Roman-Catholic priests. Catholic churches were desecrated. Inviting a Catholic priest to a house carried the death penalty. Due to this severe suppression, most Roman Catholics in Jaffna and in all other coastal areas of the island could not receive their sacraments any more. Hearing of this, the Oratorian Priest Joseph Vaz from Goa travelled to the Jaffna Peninsula, disguised as an Indian ascetic. In 1689, he lived in hiding in a village called Sillalai. In 1690, he was forced to change to Puttalam, where he worked as a priest for one more year. Joseph Vaz then travelled throughout the country, bringing the sacraments to clandestine groups of Roman Catholics. 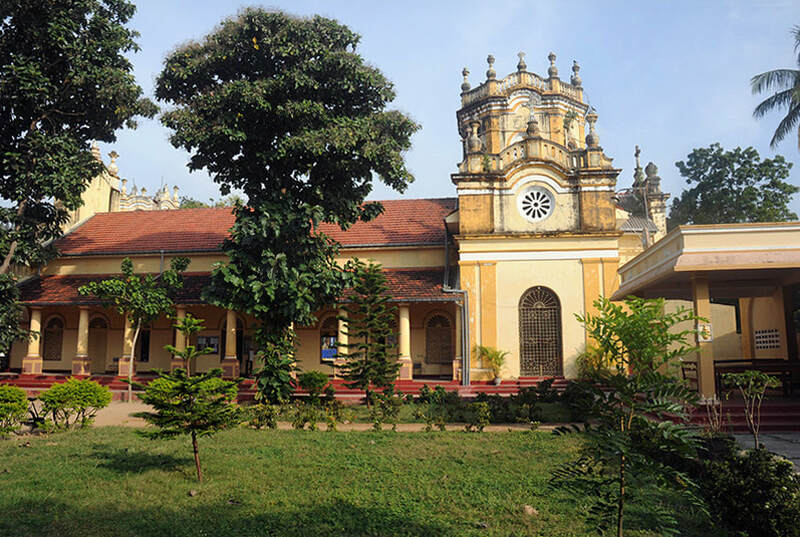 Later on, with the support of the Kandyan King, who opposed Dutch rule, Joseph Vaz was able to revitalise the Roman Catholic Church on the entire island. After 24 years in Sri Lanka, Joseph Vaz died on the 16th of January 1711 in Kandy. He was canonized by Pope Francis in January 2015 in Colombo. Although preferring the Anglican Church, the British turned out to be less restrictive against Roman Catholics than the Dutch had been. Indeed, Christians of all denominations were privileged, mainly regarding opportunities of advancement in the British administration, the lower and medium ranks of which were usually occupied by locals. It became momentous that the British permitted activities of protestant mission societies. Non-British missionary activities, particularly of U.S. citizens form New England, were restricted to Jaffna and the north. Their system of social services turned out to be of high significance for the structure of the modern Tamil society, till the present day. Jaffna became famous for its educational system. Asia’s first modern university-level collegiate, then called "Batticotta Seminary", now well-known as "Jaffna College" and "Jaffna College Institute of Technology", was establish by the American Missionaries in 1823. It's located in Vadukodai 10 km northwest of Jaffna. In 1824, an American Methodist founded the first all-girls boarding school in Asia. Providing education for females was a radical innovation at that time. The protestant pattern of religious life, including modern scientific education and social services, also provoked, as contramotion, and too influenced, as setting an example, the Hindu revivalist movement. Jaffna became a kind of pan-Tamil center of Hindu publication activities, as the figurehead in Jaffna, Arumuku Navalar, was a Hindu reformer highly influential in mainland India's Tamil areas, too. There can be no doubt, that imperial divide and rule policies are a primary cause of many ethnic conflicts in former British colonies. Surprisingly, it's not entirely clear whether the British followed this strategic line of exercising power in the case of Ceylon, too. This is to say: It can not be taken for granted that British deliberately favoured Tamils in Sri Lanka, just aiming to win helpers to control the Sinhalese Buddhist majority. Although Tamils played a huge role in the colonial administration in CCeylon, this may be not entirely the result of a deliberate attempt to weaken the majority. Rather it might well be more accurate to say, that Tamil dominance in Ceylons public and commercial sector was only a side effect of a Bristish administrational measure that originally intended to satisfy the desires of Sinhalese elites. How can this be? The British - though often without success and not without Christian indiscretions - tried to avoid provocations of Buddhist institutions. This is why, in the beginning of British colonial rule, they did not allow missionaries to establish Christian schools in Sinhalese territories, since school education was traditionally provided by Buddhist monasteries. There was no such restraint in Hindu dominated territories. In the first half of the 19th century, almost all schools led by English speakers were accumulated in the Jaffna region, with the exception of very few schools of the Wesleyan Methodist Mission and the Church Mission Society of the Anglican Church in the areas of Colombo and Galle. The American Ceylon Mission (ACM) in particular played a crucial role in the educational system of Jaffna, it started with the arrival of Samuel Newell in 1813. The ACM acticities were sponsored by the American Board of Commissioners for Foreign Missions (ABCFM). All in all, Jaffna soon became the hotspot of Christian schools. A result of this was, that not only more Tamils than Sinhalese converted to Christianity, but Tamils acquired much better English writing skills. Because English education was essential to get access to jobs in the public sector, Tamils were finally overrepresented in administrational offices during and after the British colonial rule. After independence, the central governments measures to increase the percentage of Sinhalese officials in the public sector is, besides 'Sinhala only' compaigns of politicians and monks and mob, one of the root causes of the ethnic conflict that escalated in the second half of the 20th century. The old Kachcheri of Jaffna is in ruins now, the new Kachcheri building is just at the opposite side of the road. Visitor's arriving in Jaffna by car will not miss the war ruins, as they are located at the left side of Kandy Road, which is the main access road to Jaffna. A Kachcheri is a district secretariat. 'Kachcheri', a loanword of Indian origin, was initially a label used for a Revenue Collector's Office, introduced by the British. The 'Raja of the North', P.A. 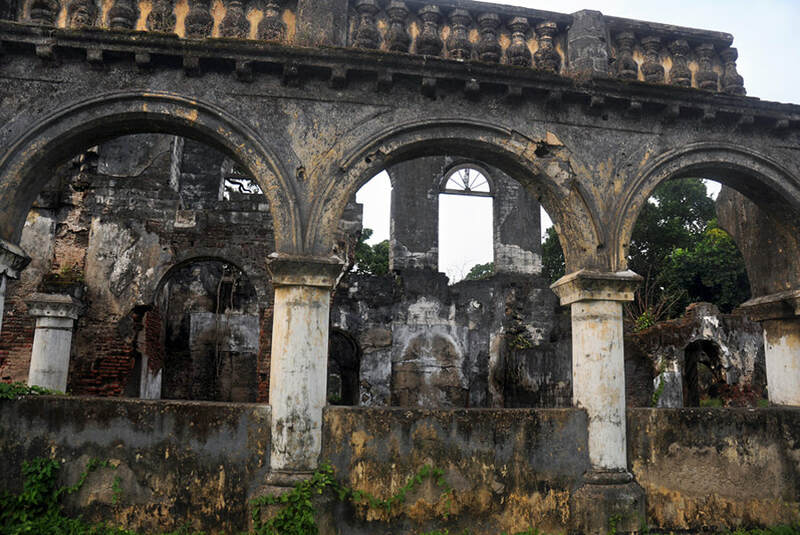 Dyke, who served as Jaffna's tax collector from 1829 till 1833 and then as Government Agent for the Northern Province till 1867, purchased the adjacent land to use it as a large garden of his residency, which was situated in one corner of the ground. Dyke bequeathed this residency beside the Kachcheri to his successors rent-free and the land became a public garden, now known as Old Park. Old Park had some rare trees. Income earned from selling fruits was used to maintain it. 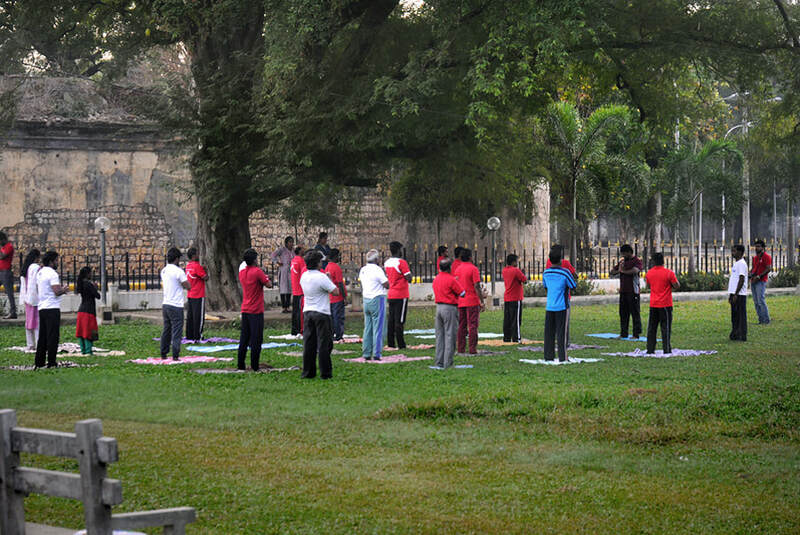 Due to its location at the major administrational building of Jaffna Peninsula, Old Park became the place of political protests, too. The most famous ones are the Satyagrahas (sit-ins) from February till April 1961, after the newly elected government of the world's first female prime minister, Sirimavo Banadranaike, announced implementation of Sinhala as the only official language in January 1961, also in Tamil areas, where many citizens were not able to speak Sinhala. The Sinhala-only policy of various governments of Ceylon led to the dismissal of many Tamil public servants even in Tamil-speaking areas. In February 1961, a non-violent Satyagraha campaign was organised by the major Tamil party and took place mainly at the Kachcheri and in Old Park. Kathiripillai Thurairatnam, who had been educated at the protestant Jaffna College in Vadukodai, played a leading role in organizing the first Old Park Satyagraha. Figurehead of the peaceful protests was S.J.V. Chelvanayakam, who was a Protestant Christian and member of the (partly Anglican) Church of South India (CSI) and educated at the Americon Ceylon Mission's St. John's College in Jaffna. Chelvanayakam was the undisputed leader of the Sri Lankan Tamil community until his death in 1977. Being a proponent of federalist structures in the 1950s and 60s, he became an outright separatist in the 1970s, though remaining a figurehead of non-violence, as a Gandhian way to independence. After his death, the advocates of armed resistence became the most influential groups in Tamil politics. As violence increased in Jaffna in the early 1980s, the Sri Lankan army stationed troops at Old Park. Only after the withdrawal of the Indian Peace Keeping Forces (IPKF), who had taken control of Jaffna in 1987, the separatist army LTTE, infamous for acts of terror on an unprecedented scale and also for a system of forced recruitings of child soldiers, managed to occupy Jaffna. They misused the former Kachcheri building as the headquarter of what they called police. An army camp was once again based in Old Park after Sri Lankan government forces finally recaptured Jaffna in 1995. Later on, the demining of the area turned out to be difficult, since many landmines placed by the rebel army had been overgrown by roots of trees. Despite the return of government forces and the civilian population, the old Kachcheri was not used any more, a new District Secretariat was constructed. 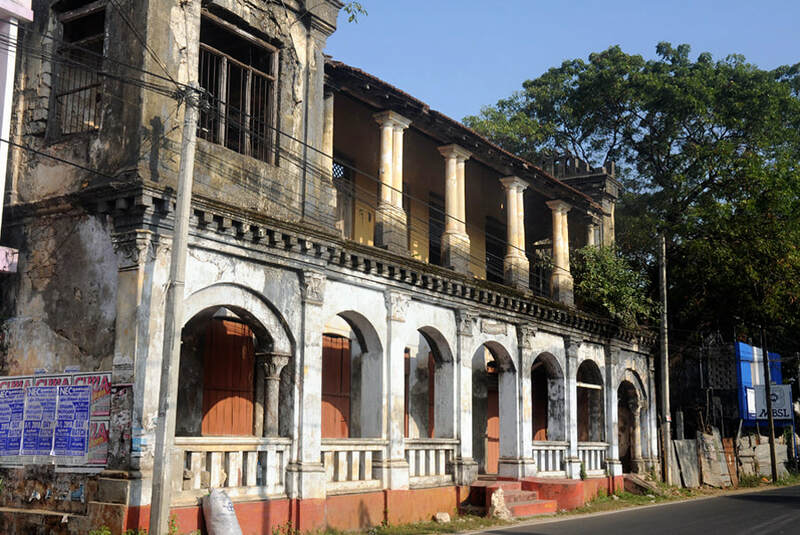 The old Kachcheri, which was one of the most significant colonial buildings of Jaffna, fell victim to neglect. In 2000, the rebel army avanced to the suburbs and Jaffna. The already crumbling walls of the old Kachchery finally fell victim to their artillery fire. Today, the ruins are a kind of war memorial, a monument recalling the devasting effects of violence. Only as late as 2012, three years after the end of the civil war, Old Park was opened to the public again. Though Jaffna has started to become a flourishing city again after the end of the civil war in 2009, traces of that two and a half decades of destruction can still be seen at many places in town. More and more ruins may disappear in the course of time. Visible reconstruction has already taken place. Daily life got back to normal. Some refugees have already returned. The Tamil overseas diaspora and the Tamil business community of Colombo started to invest in commercial enterprises. European states and the USA and India have supported redevelopment projects, and contributed to the renovations of the infrastructure in Tamil areas in particular. Jaffna is currently developed under the World Bank funded scheme called 'Sri Lanka Strategic City Development Project (SCDP)' scheme, which has already been implemented in Kandy and Galle. The World Bank's Jaffna project to redevelop urban services started in 2016 and will continue till 2021. Jaffna's inner city and busy commercial hub, comprising the urban districts called 'Fort' and 'Hospital' and 'Bazaar', is situated just north of the Dutch Fort. The central bus stand and bank offices and supermarkets and ware houses are at Hospital Road, many restaurants and the jewellery stores can be found in Kashturiya road. Very cheap local wattlework made of Palmyrah palm leafs can be bought at the central market. Mosques can be seen to the east and churches to the west of the city center and, as already mentioned, the most important heritage landmarks, Dutch Fort and Jaffna Library and British clocktower, are located just to the south. The University of Jaffna (faculty of science) is 1 km further north. The most important pre-colonial remnants of the Jaffna Kingdom's history are to be found 2.5 km to the northeast, in the suburb of Nallur. Confusingly, there is not a simple answer to the question: Is Nallur Jaffna or at least a part of it? Yes, Nallur is a suburban quarter belonging to the municipal council of Jaffna. And even more: Yes, it was indeed Nallur which was the capital of a Tamil principality called 'Jaffna Kingdom' in the late Middle Ages and in the 16th century. But even so it's true: No, administrationally Nallur is a divisional secretary apart from Jaffna city and it's distinctive due to historical developments, too. It was colonial rule that shifted the capital of the peninsula from Nallur to Jaffna city, since the latter is situated at the ocean and Nallur was not. In a way, Nallur can be called the 'precolonial Jaffna'. The Portuguese rulers destroyed the main temple of the Jaffna Kingdom, the great Nallur Kandaswamy Kovil, dedicated to Murugan (aka Skanda or Kanda), the most beloved deity of Tamils in India and Sri Lanka. Under British rule, the Murugan temple was newly erected, though not at its original location, which is still occupied by a church 1 km further west. The impressive Hindu shrine in the typical South-Indian 'Dravidian style' of sacral architecture is dominated by typical tall gateway towers called 'Gopurams'. It's now the Hindu landmark of Jaffna and of the entire peninsula and actually the largest Hindu temple complex in Sri Lanka. 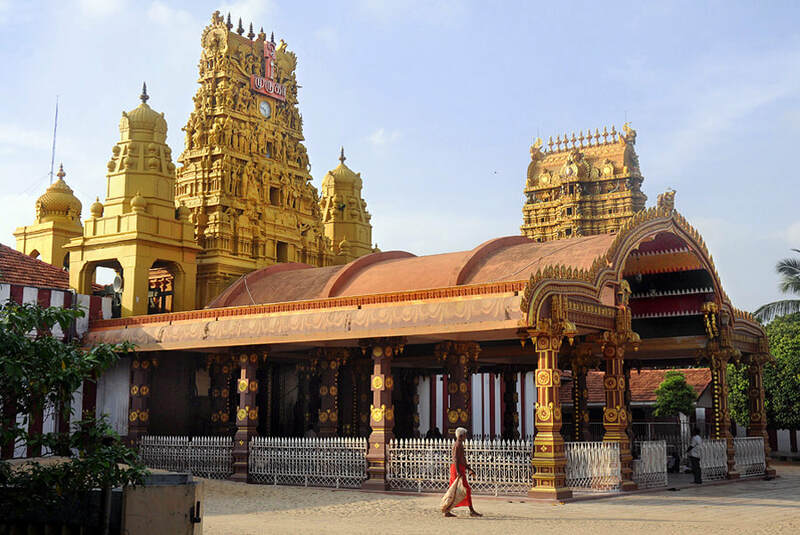 In a sense, Nallur is the island's centre of Shivaism, too, though the main temple dedicated to his son and not one of Sri Lanka's four main Shiva shrines called Ishvarams. However, Shivaite Ashrams are clustered near Nallur Kandaswamy Kovil. Nallur has become a centre for Vedanta studies. A colourful annual 16-day temple festival celebrated end of July / begin of August attracts Hindus from other regions, too. Jaffna, of course, is the gateway to all attractions of the penisula and the neighbouring islands. The causeway to Kayts island begins at Jaffna Fort. All main roads of the peninsula cross in Jaffna. Point Pedro, the northernmost point of Sri Lanka, is in only 30 km distance. Public bus service from Jaffna's central bus station close to the central market is available to all villages of the peninsula and many of the islands, too. Nonetheless, the most comfortable way to visit the attractions of Jaffna District - such as Nallur Kandaswamy temple, Manalkadu sand dunes, Point Pedro, Nilawarai well, stupa group of Kandarodai, Nagulesvaram temple with Kirimalai springs, ancient port of Jambukola, Casuarina Beach on Karainagar Island, Fort Hammenhiel islet between Karainagar and Kayts, sacred Nainativu Island and Delft horse sanctuary - is to enjoy our services, just contact us.